Personal weather stations are devices installed and maintained by weather enthusiasts across the country. Some are installed at homes, while other are installed at schools or businesses. NBC 6 News has partnered with Weather Underground to gain access to their more than 200,000 weather stations worldwide. These personal weather stations provide live data feeds of hyperlocal current conditions. They can contain many different weather measurement tools, including thermocouples, thermistors, hygrometers, barometers, anemometers and more. Most can measure temperature, relative humidity, pressure, rainfall and wind speed and direction. Some also include cameras that can provide images of weather as it happens. Our meteorologists have access to this info, and can showcase it during their daily on-air forecasts and during severe weather situations. And now you have the same access to them online. Just look for the "Personal Weather Station" link on the main weather page or change your location on our mobile website. 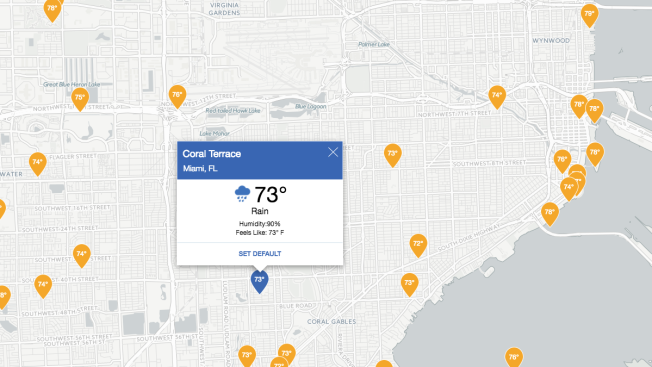 Once there, you can search for the personal weather station closest to you, which will provide a hyperlocal look at what is happening in your neighborhood. Set that station as your default location and have immediate access to weather data that matters to you. For a more in-depth look at how personal weather stations work, click here.